This week’s maps use data from the Export-Import Bank and the US Census Bureau to display the effect of Ex-Im Bank financing on each state. The maps show that Washington state, home of Boeing, garners the bulk of the benefits in terms of both Ex-Im Bank disbursements and as a percentage of total state export value, even though taxpayers across the nation are equally exposed to liability. The first map displays data from the Export-Import Bank’s congressional map tool. The web interface contains more specific details than are presented in the bank’s annual reports; it breaks down all transactions by state (plus the District of Columbia and Puerto Rico) and by small business activity. We extracted data from FY 2007 to FY 2014 for all Ex-Im Bank disbursements for each state along with the proportion of small business transactions reported by the bank. We then summed the total for all states and determined each state’s share of total Ex-Im disbursements. The map displays this proportion for each state on a map of America. Each state is shaded according to the proportion of Ex-Im disbursements that it received. The first map shows that Washington state is the clear winner in terms of total Ex-Im disbursements, receiving a massive 43.6 percent of all Ex-Im Bank disbursements from 2007 to 2014. Washington is the home of Boeing, one of Ex-Im Bank’s biggest beneficiaries, but the sheer size is nonetheless startling. 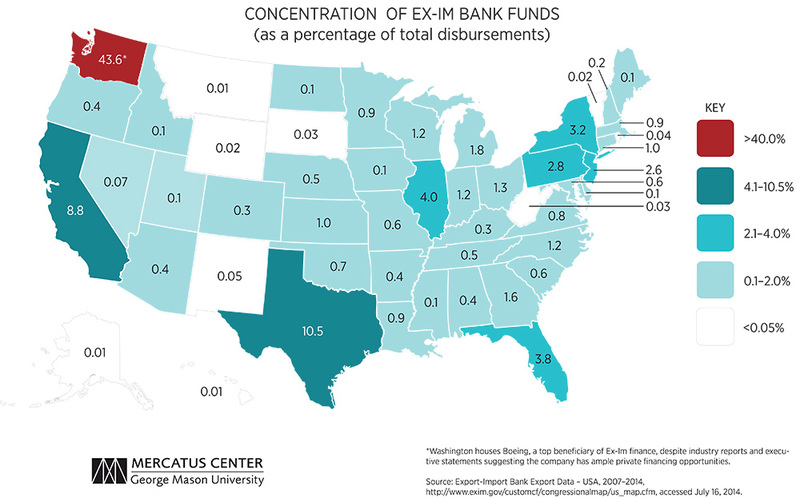 Larger states like Texas and California only respectively pulled in 10.5 percent and 8.8 percent of total Ex-Im Bank disbursements during the same time. An astounding 42 states received less than two percent of Ex-Im Bank disbursements, with 35 of these receiving less than one percent. While businesses in most states barely benefit from the Ex-Im Bank at all, their taxpayers are just as exposed to Ex-Im Bank liabilities as taxpayers in states that receive the most Ex-Im Bank backing. The second map uses data from the same Export-Import Bank congressional map tool and the US Census Bureau’s datasets on state exports from 2007 to 2014. In this case, we wanted to see what the impact of Ex-Im Bank financing had on each state as a percentage of that state’s total exports over the same period of time. We extracted Census data on total state exports and calculated the percentage of export value that Ex-Im Bank records claim were backed for each state. The results are displayed on a map of America, and each state is shaded according to the proportion of state exports that are backed by the Ex-Im Bank. States whose exports were more significantly backed by the Ex-Im Bank are darker, while states whose exports received less backing are lighter. The second map displays a similar pattern to the first. Washington state is again the big winner in terms of state export value supported, with an incredible 22.67 percent of state exports backed by the Ex-Im Bank since 2007. The state percentages drop off quickly from there. While almost four percent of Wisconsin’s exports and about 3.5 percent of Massachusetts’s exports were backed by the Ex-Im Bank, the Ex-Im Bank supported less than two percent of the exports of 41 states for the same time period. 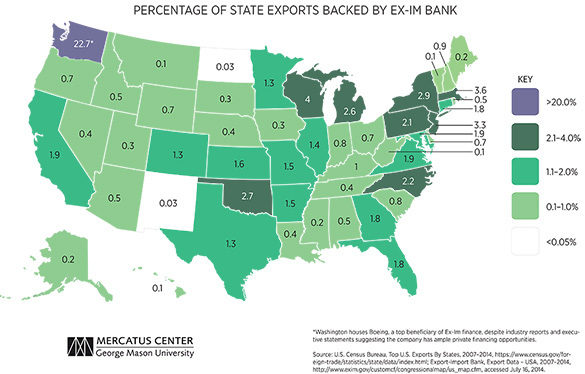 The Ex-Im Bank yields negligible benefits for the vast majority of state exports. But the concentrated benefits it yields to a few beneficiaries makes the reform necessary to prevent widespread losses that much harder.